Netflix has given us a few fleeting glimpses at its Gilmore Girls revival already, including a quick teaser and a series of preview images, but those mostly focused on Lorelai and Rory. Sure, they’re the Gilmore girls of the title and the show is all about them, but the original series always made sure to occasionally focus on the wacky characters that the Gilmore girls encountered in their daily lives. Thankfully, this new batch of preview images primarily focus on one of those wacky characters, even if he is the least wacky of the whole bunch. 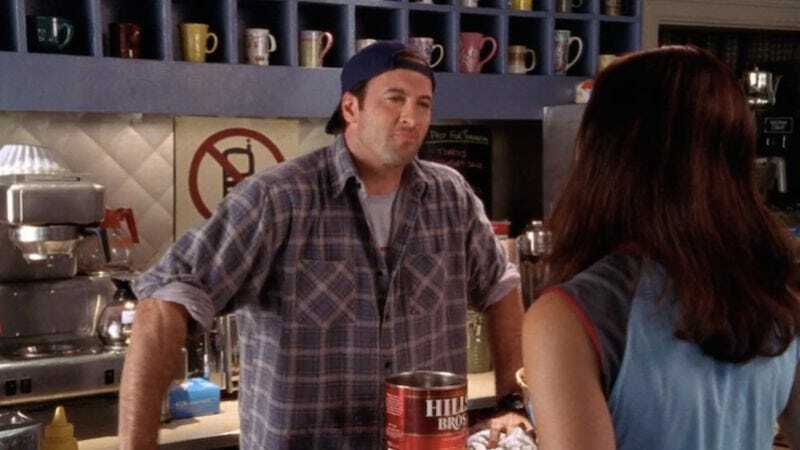 We’re talking about Luke Danes, the cellphone-hating, hat-wearing diner man who appears in these photos doing the two things he loves the most: standing while wearing a plaid shirt and having an intense conversation with Milo Ventimiglia’s Jess Mariano. Oh yeah, Jess is also in one of these photos, just in case Gilmore Girls fans still have a place in their hearts for the not-so-bad boy with the powerful emotions and fondness for inviting girls out for a day in the big city even though they don’t have permission from their mom. This is Luke looking on while three other people eat dinner. In this scene he has probably turned invisible so he can hear what people say about him when he’s not around. It turns out they just talk about how he wears plaid shirts and doesn’t like cellphones.